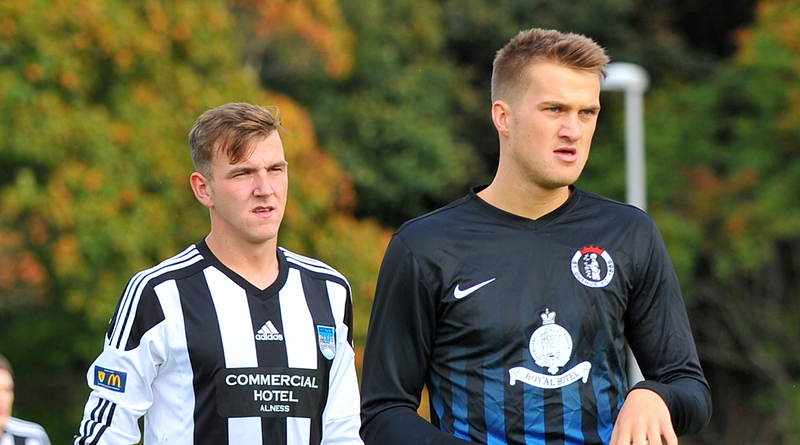 IT WAS a great game for the neutral on Saturday as Alness United and St Duthus served up a six goal quarter-final battle at the Highland Football Academy - but for St Duthus the result ultimately ended in an early exit from the North Caledonian Cup. There were very few changes to the squad who were victorious over Golspie last weekend. Top scorer Scott Miller was the most notable absentee, as Calum Neil came into the team for what was to be the only change made. Jordan Mackinnon, Calum MacDonald, Andrew Macleod and Glenn Fell all made returns to the squad, taking places on the bench. A minute's silence was impeccably observed by both teams prior to the kick off in memory of Robert Chatten who sadly passed this week. It was honours even during a first half that was well contested by both teams in a spirit befitting of a 'cup tie'. Alness United eventually broke the deadlock after 21 minutes when a Callum Gow cross found Jack Hudson in the box and the midfielder sent the ball glancing past Ali Matheson to make it 1-0. United's lead lasted just thirteen minutes though. Levelling the scores, Cammy Mackintosh notched his fourth of the season with a stunning 25 yard shot which was thundered in off the underside of the crossbar. It took until the 65th minute for the second half breakthrough to be made and it came for St Duthus, as they took the lead for the first time in the game. An expertly taken long throw from Liam Rostock was sent into the United area and connecting with the ball, Gordon Finlayson flicked a headed just under Jodie Campbell to net an unfortunate own goal. Now with the advantage, St Duthus looked to kill the game off on 70 minutes when Liam Rostock played Cammy Mackintosh in on goal but Alness custodian Campbell was in fine form, pulling off a reaction save from the Saints' midfielder's snap shot. With a quarter hour remaining though, the game fell out of the Tain side's grasp. Saints' centre half Charlie MacDonald was next to find the wrong net when he connected with a Craig Munro free kick, and the own goal realigned the scores at 2-2. It was disaster for the Saints on 80 minutes when Finlayson made amends for his earlier mistake with an excellent finish after cutting inside and finding the far corner of the net to make it 3-2. The Saints' chances of snatching an equaliser were put to bed four minutes later when substitute Connor Ross made it 4-2.